The concept is really simple: any user in Yammer can add a specific topic to an interesting conversation; for example a quote, an article or a link. The default topic is #YamNews. 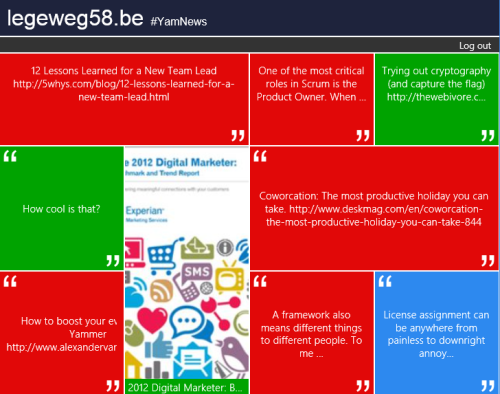 The Yammer News application collects all the conversations with a #YamNews topic in Yammer, and renders them on a single page with a colorful tile based interface. 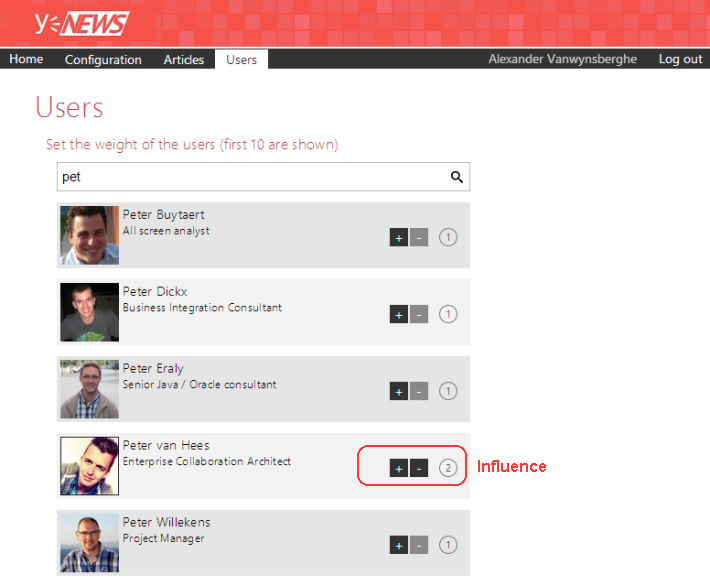 Peter Van Hees will also make a blog post about the Yammer News concept, including some reasons why we think you will really like it! In this post, I want to give you a quick overview of the interface, and how you can start using the application. In follow-up posts, I will dig into the technical aspects of the application like the API calls we used, the message-polling handling, how we keep everything secure and many other things. After all, our mantra reads: sharing is caring! Starting with Yammer News is really easy. 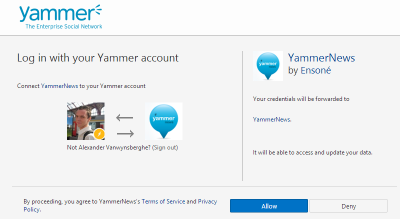 When you browse the link yammernews.com, you will see blue Yammer button that will look familiar to you. When you click the button, you will be re-directed to the Yammer authentication page. This page tells you that Yammer News will be connected to your Yammer account. This account is the one that is currently used in your browser session. If you’re not yet logged-in to Yammer, you will see a username and password box there. Click “Allow‘ to continue. But to be honest, if you are the first user of your network that is using Yammer News, it won’t resemble this colorful interface. Your first try will resemble a white piece of paper, this is perfectly normal (for now). So no worries, at the end of this article, you will be mastering our application! The “configuration” section allow you to customize the look and feel of Yammer News. You will notice that it looks familiar to the Yammer design section. You can choose the banner colors using some “pre-defined” colors, or you can give it your own flavor. 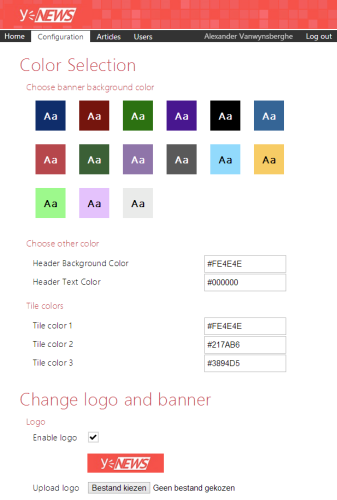 You can also select the 3 tile colors that are used in the application. The other section on that page is about the logo and the banner (masthead). You can upload custom images and enable both your logo and/or your banner. Articles: Here you can “search” for an article in Yammer news (meaning: a message that has been captured based on your topic). If you find the correct message, we will give you the ability to “block” this message from Yammer News. Let’s say that a co-worker added the topic #YamNews to a message that is not appropriate to be shown in the application (or an article the references an event that already occurred), you can easily hide/block it this way. Hashtag: This is place where you define the “filter” for your Yammer messages. The Yammer News application collects all the conversations with the selected topic in Yammer. Note: if you decide to change the topic, existing messages (based on the “old” topic) will still be listed. As an example: Let’s say there is an interesting conference today, and you would like to show some conversations about that conference that employees are Yamming about, you can change the topic for one day and the messages will be captured. Afterwards you can change it again to whatever topic you. It will also capture “old” conversations on Yammer back to 4 months in time. Recent conversations on Yammer (up to 20) will be shown / added within 5 minutes, but the older ones can take up to 6 hours before they are all listed. Reset: If you click that button, all messages will be removed from Yammer News. You will have an empty application. From that moment on, new messages will be captured by Yammer News based on the topic that you selected. 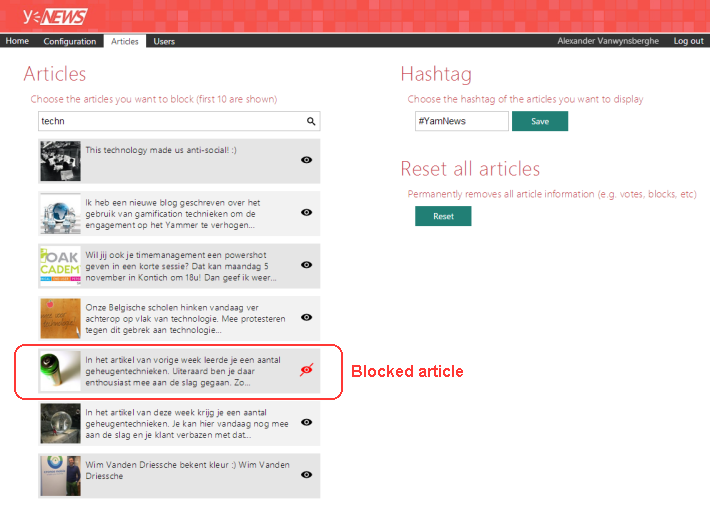 You will also loose the votes on the articles and the “blocked” status. The “users” section gives you the ability to manage the “weight” of messages posted by a user. The higher the weight, the more important the messages of that user will be. If the message is important, it will show up higher in Yammer News. You will find the most import message on the top-left corner of Yammer News. You can for example set the weight of your CEO/CIO a bit higher than the other members, meaning that the messages from that person will have a higher priority. If you’re an administrator of an Enterprise Yammer Network, you can start customizing the look’n feel of YammerNews. You can also change the default topic to a topic that you like. Help! The Yammer News application doesn’t contain any articles? If you’re the first user of your Yammer Network that is using Yammer News, the feed will be empty. It takes about 5-10 minutes to capture all messages based on the default topic #YamNews. This first poll will capture the last 20 messages who are tagged with this topic. There is an additional a-synchronous batch that will capture “older” messages up to 4 months back in time. This can take 6 hours maximum, but in the meantime, you will see at least 20 messages already. Help! There is a message in a (private) group that is not displayed? Only public messages are captured. We respect privacy, so only messages that are posted in a public group or the ‘all company’ feed will be captured. Help! There are articled in Yammer News with different topics in Yammer? If you change the topic in the admin section, be aware that the messages based on the ‘old’ topic will still be listed. If you want to start clean, use the ‘Reset’ button. Help! I love this, but how do enable this form my External Network? Only home networks! This (free) version will only capture conversations from your home networks. So no external networks! Help! The screen refreshed automatically? It auto-refreshes! So no manual reload of your browser. The application will append new messages automatically to your feed in Yammer News. Those new messages are captured every 5 to 10 minutes. If you have any feedback for us, feel free to reach out for us! Your feedback is really valuable to us.